“The concern I have is that people (medical doctors, patients, and the general public) will become disillusioned by the many studies (including Zamboni et al), which refute the use of venoplasty to achieve a “cure” for MS. Zamboni has highlighted the connection between MS and a chronic venous disease, which I appreciate. However, since 2011 I have suspected his theory that venous obstructions cause demyelination (due to iron-deposition which accompanies vascular reflux) to be incorrect. In a published pilot study (4), we showed that venoplasty appeared to improve cerebral perfusion and I feel this is the mechanism which explains why some pwMS experience symptomatic improvement following venoplasty. But this effect was short term in most, and only occurred in approximately 30% of those treated. We analysed 2 pilot studies in NSW, one at St Vincents Hospital and a later one at Prince of Wales Private Hospital. Both came to the conclusion that venoplasty was generally ineffective in improving the symptoms of pwMS in the long term. The major participants had no enthusiasm for publishing negative results from pilot studies, and no randomised placebo controlled trials were planned. We abandonded venoplasties for CCSVO (Chronic CerebroSpinal Venous Obstruction) in MS in 2012. At that stage, we had performed over 200 procedures. Never-the-less, the objective diagnostic ultrasound examination that we developed (5) to diagnose obstructive venous disease in the neck veins (in contrast to the subjective Zamboni ultrasound) appeared to be accurate, reproducible and indicated that the venous obstructions were due to a chronic inflammatory venous condition that resulted in obstructions to both the internal jugular veins AND the vertebral veins. Interestingly, the vertebral veins have been largely ignored by Zamboni and others – perhaps because they can’t be treated by venoplasty. After seeing David Wheldon’s website suggesting that a chronic persistent chlamydophila pneumonia infection was the likely cause of disease in a large sub-group of pwMS, I developed the theory that MS was due to a chronic infective cerebrospinal phlebitis and venulitis (published in Phlebology in 2012.). From that time, we have treated pwMS with the combined antibiotic protocol developed by the Stratton group (Vanderbilt University, Nashville) and David Wheldon. My observations are that the results have been superior to venoplasty, particularly in RRMS with positive serology to Cpn, with relapses completely suppressed and only rare instances of new lesions developing on MRI examinations. Our 6-month follow-up with ultrasound flow measurements in the affected neck veins (published in Phlebology) (6) shows significant improvements in those with positive serology testing to chlamydophila pneumonia (Cpn) infection. This article also highlights the possibility that chronic persistent infection with Cpn is widespread in the community but only a small percentage go on to develop MS. Some other factor, such as a genetic or concurrent infection with an agent like EBV, is likely to be involved at a critical time early in life. Therefore CCSVI (O) is likely to be observed in many “normal” people who are included in randomised trials, which explains why so many studies have shown that the neck vein obstructions are observed in the “normal” population, but generally not at the rate found in pwMS. This is consistent with the epidemiology studies of the most famous MS neurologist, Prof John Kurtzke who concluded that MS was caused by an infection that was widespread through the community, but only a SMALL proportion went on the exhibit MS. So why do some people have such a good result with venoplasty alone? I suspect that they have a “burnt-out” Cpn infection, that has been completely controlled by their immune system, but has left resultant venous obstructions that cause reduced cerebral perfusion. These people test negative to Cpn. This state will be improved by successful venoplasty. 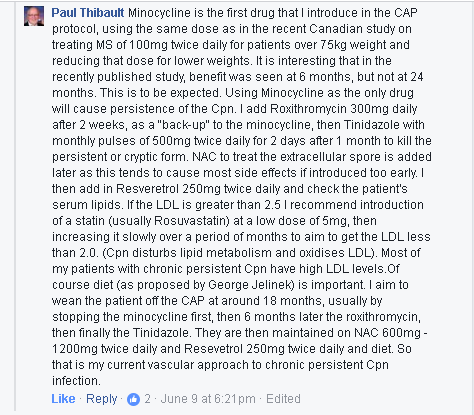 As for the other > 90% who have chronic persistent Cpn infection but don’t have MS, they will be prone to other vascular and “auto-immune” disease including coronary artery disease, cerebro-vascular disease, thyroid disease, CFS, polymyalgia, reactive arthritis, thrombo-embolic disease, rosacea and possibly lymphomas of the head and neck. PwMS have a high co-morbidity with these diseases.